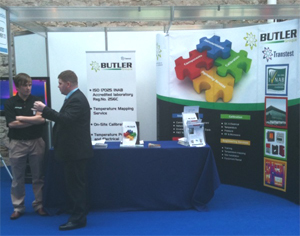 Transtest – the calibration division of the Maynooth based Butler Group, participated in the BioMedica Conference and Exhibition at the RDS in Dublin recently (27th and 28th April 2010). The two day conference, organised by the Academy of Medical Laboratory Science in Ireland, showcased leading local and international suppliers to the Biomedical Science market. Butler Transtest Ltd. a leader in calibration services in the Irish market since 1998, with its own INAB accredited laboratory attended the conference to market their calibration capabilities to the different pathology laboratories. Butler Transtest Ltd. has developed its accredited calibration services and expertise into a number of different markets over the last number of years and in particular to customers within the Biomedical and Life Science market. The Conference and Exhibition was aimed at highlighting the technology available to pathology labratories to enable them to maintain their high quality service at national and international level. Butler Transtest Ltd. was pleased to attend and showcase their expertise. Butler Transtest Ltd. has an INAB ISO 17025 laboratory with accreditation in Electrical Temperature and Pressure Calibrations, specialising in Temperature Calibrations and Temperature Mapping services which can be done both in their state of the art laboratory in Maynooth and on site. Butler Transtest Ltd. is the calibration division of the Butler Group, a leader in the provision of components, instrumentation and engineering solutions to a number of different technology driven markets within Ireland. For further information on the Calibration Services of Butler Transtest Ltd., please contact Aidan Butler on 01-6292620.